Many scientists fear that global warming will hit staple food crops hard, with heat stress, extreme weather events and water shortages. On the other hand, higher levels of carbon dioxide--the main cause of ongoing warming--is known to boost many plants' productivity, and reduce their use of water. So, if we keep pouring more CO2 into the air, will crops fail, or benefit? A new study tries to disentangle this complex question. It suggests that while greater warmth will reduce yields of some crops, higher CO2 could help mitigate the effects in some regions, unless other complications of global warming interfere. "Most of the discussion around climate impacts focuses only on changes in temperature and precipitation," said lead author Delphine Deryng, an environmental scientist at Columbia University's Center for Climate Systems Research, the NASA Goddard Institute for Space Studies and the University of Chicago's Computation Institute. "To adapt adequately, we need to understand all the factors involved." Deryng cautions that the study should not be interpreted to mean that increasing carbon dioxide is a friend to humanity--only that its direct effects must be included in any calculation of what the future holds. In 2014, Deryng and her colleagues published the first global calculation of how heat waves might affect crops, and found that maize, spring wheat and soybeans would all suffer. When they added the effects of carbon-dioxide fertilization, they found that maize yields would still go down--but that spring wheat and soybeans might actually go up. Some media misinterpreted the study to say that climate change might help agriculture overall. The picture is much more complicated, say the authors. Deryng says the study is sturdier than past research, because it uses new data from experiments done in actual farm fields, and a half-dozen global crop models, several of which only recently became available. Nevertheless, she says, the uncertainties remain large. 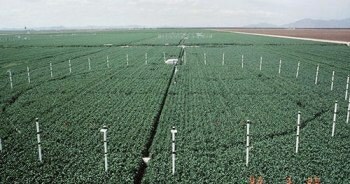 Field experiments, which involve blowing CO2 over sizable farm fields for entire growing seasons, have been done only at a handful of sites in the United States, Germany, Australia, Japan and China--not in Africa, India or Latin America, where subsistence farming are mainstays of daily life. She noted that greater yield also might not translate to more nutrition. For example, greater carbon uptake might not be balanced by other nutrients such as nitrogen, and trace elements like zinc and iron that are needed to make crops nutritious. Bruce Kimball, a retired researcher with the U.S. Department of Agriculture who has studied crop-CO2 interactions, said the paper does "a good job on a huge scale," though, he said, "more data from more crops from more locations" is needed." Kimball cautioned also that previous research has shown that the benefits of higher CO2 levels tend to bottom out after a certain point -- but that the damage done by heat only gets worse as temperatures mount. "Thus, for greater warming and higher CO2 the results would likely be more pessimistic than shown in this paper," he said.